Charlesworth Blount was born on 22 November 1721 at Chowan Co., NC. He married Mary Clayton in 1744 at Perquimans Cnty. Charlesworth Blount died on 11 March 1784 at Perquimans Cnty. at age 62. Mary Clayton was born on 25 May 1728 at Perquimans Co., NC. She married Charlesworth Blount in 1744 at Perquimans Cnty. Mary Clayton died on 28 August 1767 at Perquimans Co., NC, at age 39. Information from Ms. Elizabeth V. Moore, Edenton, NC. Will probated by July court 1775. John Harvey was born in 1726 at Perquimans Co., NC. He died in 1775 at Perquimans Co., NC. Nathan Creecy was born at Chowan Co., NC. Will probated September 1818 Court. He was the son of Levi Creecy and Mary Charlton. Nathan Creecy married Elizabeth Rice, daughter of David Rice and Judith (? ), in March 1788. Nathan Creecy died in 1818 at Chowan Co., NC. Elizabeth Rice was born at Chowan Co., NC. Death by 21 Jan 1818. Information from Ms. Elizabeth V. Moore, Edenton, NC. She was the daughter of David Rice and Judith (?) Elizabeth Rice married Nathan Creecy, son of Levi Creecy and Mary Charlton, in March 1788. Elizabeth Rice died on 21 January 1818 at Chowan Co., NC. Levi Creecy was the son of Levi Creecy and Patience (?) Probate April 1772. Levi Creecy married Mary Charlton, daughter of John Charlton and Sarah Hoskins, on 1 October 1750 at Chowan Co., NC. Levi Creecy died in 1772 at Chowan Co., NC. Mary Charlton was the daughter of John Charlton and Sarah Hoskins. Mary Charlton died at Chowan Co., NC. Mrs. Mary Charlton Haughton, probably born Chowan County, NC. Information from Ms. Elizabeth V. Moore. She married Levi Creecy, son of Levi Creecy and Patience (? ), on 1 October 1750 at Chowan Co., NC. Probate 13 may 1736. Information from Ms. Elizabeth V. Moore, Edenton, NC. John Charlton was born on 23 February 1698 at Perquimans Prec., NC. He died in 1736 at Chowan Co., NC. "of age" by 23 June 1754. David Rice died in 1804 at Gates Co., NC. Probate Feb court 1808. Judith (?) died in 1808 at Gates Co., NC. John Colt was the son of John Colt. John Colt was the son of Peter Colt Sir. Peter Colt Sir was the son of John Colt Sir. Sir John Colt, a Peer in england in Cromwell's day, headed his country's troups in the civil wars; had three horses killed under him; broke his sword in action, but replacing it gained the Victory. From this circumstance came the Colts' coat of arms (a horses head) emblematical of his exploits in this action. In the revolutions which followed, he lost his titles and estates, which were, however, restored to his son, sir Peter Colt. Sir Peter Colt, son of Sir John, remained Peer of the Realm. The next 4 generations are traced through the line that came to America. Rev. John Madison Carpenter was born on 10 August 1810 at Brunswick Co., VA. He was the son of John Carpenter and Rachel Brewer. Rev. John Madison Carpenter married Elizabeth Horn on 12 August 1830. Rev. John Madison Carpenter died on 22 December 1898 at Belton, Texas, at age 88. John and Elizabeth were enumerated in the 1860 Belton PO, Bell Co., TX, federal census (M653-1288, page 315a). He was a farmer age 49, she was 50; he was born in VA, she in KY. Children enumerated in the household, all born in KY, were Wash. 23, Thos. 17, J. W. 15, Lemuel, 13, and Louisa 10. There are other Carpenter families nearby, born in KY, that could be children; Joseph age 28, and J. M. age 27. Elizabeth Horn was born on 14 September 1808 at Simpson County, KY. She married Rev. John Madison Carpenter, son of John Carpenter and Rachel Brewer, on 12 August 1830. [S807] Find A Grave, online http://www.findagrave.com, Find A Grave, database and images (https://www.findagrave.com : accessed 12 February 2018), memorial page for Pvt Edward Finch Lee (1821–1903), Find A Grave Memorial no. 11043564, citing South Belton Cemetery, Belton, Bell County, Texas, USA ; Maintained by SFC Frank Irons Sr. Retired US Army 1977 (contributor 46510193) . [S807] Find A Grave, online http://www.findagrave.com, Find A Grave, database and images (https://www.findagrave.com : accessed 12 February 2018), memorial page for Rebecca Lee (21 Nov 1818–30 Jul 1899), Find A Grave Memorial no. 30201374, citing South Belton Cemetery, Belton, Bell County, Texas, USA ; Maintained by SFC Frank Irons Sr. Retired US Army 1977 (contributor 46510193) . John Carpenter married Rachel Brewer. Rachel Brewer married John Carpenter. George graduated from George Washington University, with a degree in chemistry, and received his law degree from New York University. He was vice president and a director of the Nitralloy Corporation; involved with patents on the process of case-hardening of steel. He was first a member of the law firm of Hoguet and Neary (1927) in New York City, and was made a partner in 1933. He handled the U.S. patent for "Tetrapods." a French invention, used in many parts of the world for breakwater construction and man-made islands for offshore oil drilling. Later he was the senior member of the law firm of Corey, Hart & Stemple, 20 Exchange Place, New York City. [S336] Ancestry.com, Registration State: District of Columbia; Registration County: Washington; Roll: 1570936; Draft Board: 03 U.S., World War I Draft Registration Cards, 1917-1918. [S336] Ancestry.com, The National Archives at St. Louis; St. Louis, Missouri; Draft Registration Cards for Fourth Registration for New York State, 04/27/1942 - 04/27/1942; NAI Number: 2555973; Record Group Title: Records of the Selective Service System; Record Group Number: 14 U.S., World War II Draft Registration Cards, 1942. [S877] James Edson Corey, Corey. Alice Elizabeth Benson was born on 11 June 1888. She was the daughter of David E. Benson and Sarah Elizabeth Buckley. Alice Elizabeth Benson married George Herbert Corey, son of William Roe Corey and Cora May Holton, on 11 October 1916 at Elmira, NY.1 Alice Elizabeth Benson died on 24 March 1976 at Smithtown, NY, at age 87. She was buried at Methodist Church, E. Setauket, NY. 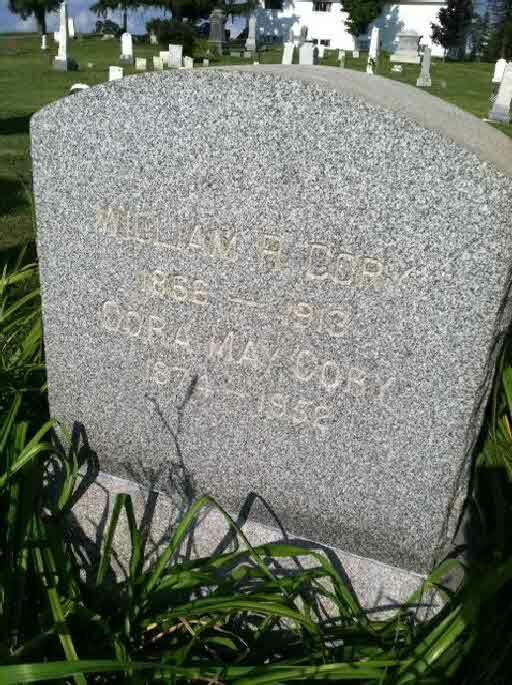 [S807] Find A Grave, online http://www.findagrave.com, Find A Grave, database and images (https://www.findagrave.com : accessed 28 June 2018), memorial page for William Roe Cory (2 Aug 1866–Jun 1913), Find A Grave Memorial no. 39411723, citing Coryland Presbyterian Cemetery, Gillett, Bradford County, Pennsylvania, USA ; Maintained by J. Kelsey Jones (contributor 47370830) . Mrs. Cora May Corey, 77, of Jackson Township, Saturday, Feb. 2, 1952, at the home of her daughter, Mrs. Norman Garrison of Jackson Township. She is also survived by two sons, George Corey of New York City and James Corey of Washington, D. C., five grandchldren and several nieces and nephews. The body is at the Shaw and Robena Funeral Home in Mansfield and Monday morning will be removed to the home of Mrs. Garrison where funeral services will be held Tuesday at 2 p.m. The Rev. P. C. Buono, Coreyland Cemetery (Elmira Sunday Telegram, Elmira, New York, Sunday, February 3, 1952). 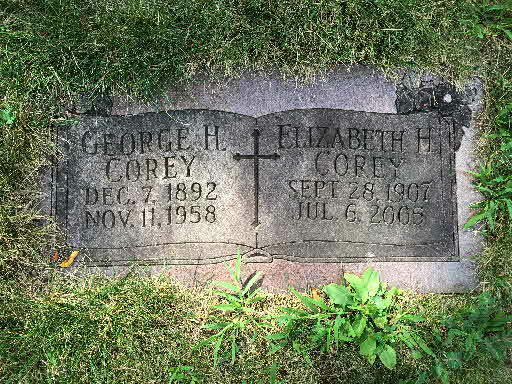 [S807] Find A Grave, online http://www.findagrave.com, Find A Grave, database and images (https://www.findagrave.com : accessed 28 June 2018), memorial page for Cora May Holton Cory (21 Dec 1874–2 Feb 1952), Find A Grave Memorial no. 39411733, citing Coryland Presbyterian Cemetery, Gillett, Bradford County, Pennsylvania, USA ; Maintained by J. Kelsey Jones (contributor 47370830) .